Nearly 20 feature documentaries played at the Boulder International Film Festival in 2010. Most were about people or events of historical, cultural, or artistic significance. The one documentary that seemed out of place is Racing Dreams, about young go-kart drivers who dream of driving for NASCAR. Yet Racing Dreams isn’t really about racing. It’s about surviving puberty and taking the first steps toward adulthood. Maybe that’s why it lives in the memory longer than some of the more seemingly significant films in the festival. Racing Dreams has some immediate appeal, like Josh, a very serious, earnest, genteel young man. He’s a good boy showing none of the ugly ravages of puberty. 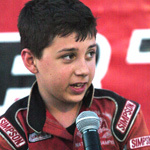 We first meet him giving a track-side interview after winning a race, sounding every bit as gracious and polished as any pro athlete in front of a camera, but without the booming voice of an adult. The cute factor may work on YouTube, but a feature documentary needs more. And by sticking with Josh, Brandon, and Annabeth for a whole season, Racing Dreams delivers more. Later we see Josh fantasizing about doing a product endorsement for Pepsi, both playacting as a kid in a cute scene worthy of YouTube; yet also nailing one of the biggest conundrums of wanting to participate in a sport so expensive that it can only be done by selling out. Brandon is the opposite of Josh. An aggressive driver, he’s driven by emotions and hormones. He roughhouses with his grandfather who looks after him while dad is incarcerated. He’s a handful for his grandmother. They consider a military academy for him as a place to shape that pent-up adolescent energy. Any documentary about a sports team or athlete inevitably takes the shape of the season. It begins before the first race and ends on the Big Day. Racing Dreams does this too, yet director/editor Marshall Curry realizes that his story has become less about the standings and more about the drivers. He completely skips one race and work the penultimate race into a quick montage. Instead he spends more time on the budding crush and the family pressures of driving every weekend. As the racing season and the movie zoom toward the end, the racers and their families begin to look to the future. If these kids are going to keep racing, they will have to graduate from go-karts to real cars. That will be a huge expense for the families. Will puberty refocus their interests away from racing? Will it even be financially possible to continue to the next level? At the finale, we do care how well Brandon, Annabeth, and Josh finish. But we’re more interested in the adults they’re going to become. This ending is just the beginning.